Security lighting is an effective and inexpensive way to protect your home. Firstly, and most importantly, you and your family should feel safe in your home. Paul Hunt Electrical Installations work with you to determine what options for security lighting are best for you. 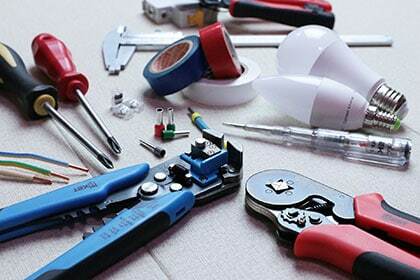 Our electricians support you with the design of your security lighting. Therefore, we can ensure that it is ascetically pleasing with strategic placement. Furthermore, we ensure that the installations are safe, discreet and free from visable cabling. Spotlights are a useful fixture at the back entrances of your property or in areas which lack visibility. In addition, they can be installed with timers and motion sensors to quickly deter any unwanted intruders in their path. They can utilise LED Lighting to provide you with a solution that saves you time, money and energy. As well as giving a modern feel to your garden, ground lights can improve the overall security of your property. With the use of LED lights, they provide cost-efficient solutions to having your garden illuminated all year round. Flood Lighting provides a high-intensity beam of artificial light for a large outdoor space. Perhaps you have a swimming pool or tennis court you wish to light up at night. Our qualified professionals and are able to advise you on the best solutions for your home inside and out. If you are looking to renovate your property, it’s important to consider installing some measure of security lighting. With the developments in Landscape Lighting, you can get instant bright lighting which saves you money and reduces your carbon footprint. Most noteworthy however is how outdoor lighting can provide you with a sense of security and peace of mind. Why not contact Paul Hunt Electrical Installations today to discuss installing security lighting for your home.